A great addition to any gaming den, this PlayStation Game Coasters 4-Pack takes inspiration from some of the best video games ever made - all released on the original classic PlayStation! 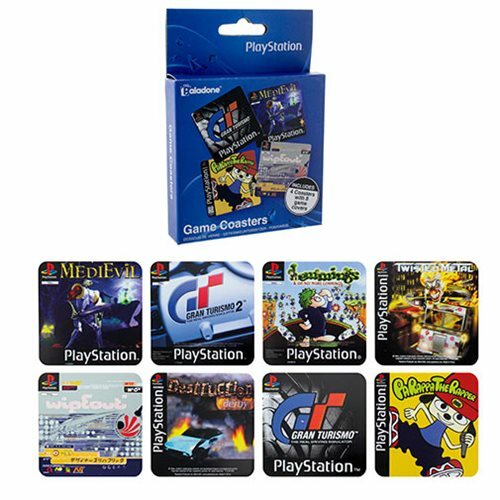 A fun retro-cool gift for gamers, the PlayStation Game Coasters 4-Pack includes 4 double-sided coasters, featuring the cover artwork of 8 iconic 90s games, including Destruction Derby, Lemmings, Wipeout and PaRappa the Rapper. The PlayStation Game Coasters 4-Pack makes a great gift for gamers! Ages 14 and up.